This had all the elements of a fairy tale ending, fumble recovery leading to a fourth and goal touchdown followed by a two point conversion, and ending in an overtime win for the Ducks. Unfortunately Cam Newton and the Tigers failed to play to the plot as they stormed back down the field to hit a game winning field goal as time expired. Nevertheless this last drive still has to be my top play of the year due to its obvious significance and clutch factor. For an Offense known for its quick pace, this was an absolute beauty to watch as Oregon’s offensive line willed the team to the finish by running eighteen plays to ice the final 9:25 of the game. Running the ball seventeen out of eighteen plays is truly remarkable. You’d think at some point Oregon would break a big run but instead they played smash mouth football with steady three, four yard gains, which eventually broke Cal’s back. 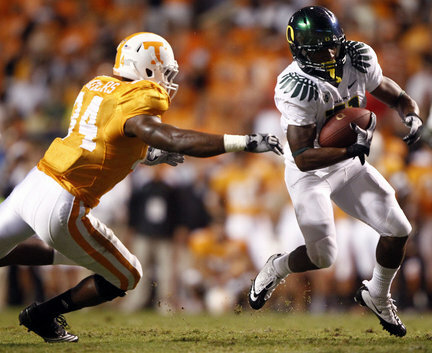 Welcome back LaMichael James, this also proved to be his “Heisman Moment” of the year. I’m not sure how many times we’ve seen LaMike run one way only to cut back the opposite way Reggie Bush-style. but I do know we’ll never again see a run as amazing as his 72-yard touchdown vs Tennessee. This play has two things going for it: First it was the play that started Oregon’s second half rampage vs. Stanford. Second, it turned into one of the coolest sports photographs I’ve seen. The photograph showing Pleasant and a blocking caravan is simply, for lack of a better word, awesome. In other news, fans hope Pleasant, recently convert from linebacker to the defensive backfield, learns the art of pass coverage over the offseason. Oregon State had just forced Oregon into a rare three and out and lined up in a punt formation only to run the ball 64 yards straight up the middle. My first reaction following the snap was, great our long snapper botched the snap. However, moments later my eyes readjusted to see Michael Clay turning on the jets as he headed into the red zone, which led to a crucial touchdown. Just another one of those moments which shows how unique and risky Chip is. Who else would go for it on fourth down in the opponents territory with the lead? In terms of individual efforts, I think this would rate as the best play of the year due to Meahl’s diving deflection effort. I mean for crying out loud LeBron even gave him a shout out on Twitter after that catch. Only thing missing was getting him miked up during games. One of only two Oregon touchdowns in the game. This was also the moment that Cliff Harris proved to me that no matter how reckless he may be with the ball, you have to leave him back there to return every punt. On a side note, was there any better special teams unit than Oregon this year? Besides for a slight slip up at the end of the year in the kicking game, I don’t think there was (slightly biased view). 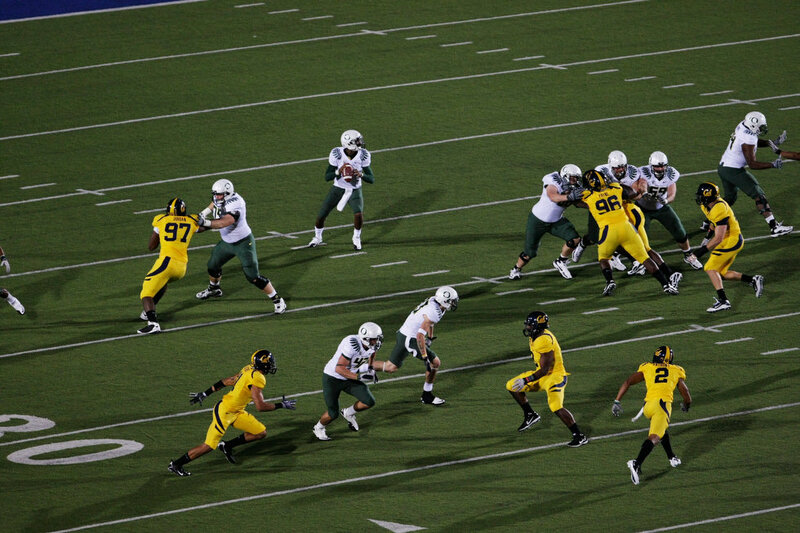 First play from scrimmage in the Civil War and Mathews came through the line and broke Katz in half. Made that last part up but still this play sent a message to our favorite neighbors along I-5 and helped reinforce the “little brother” notion. 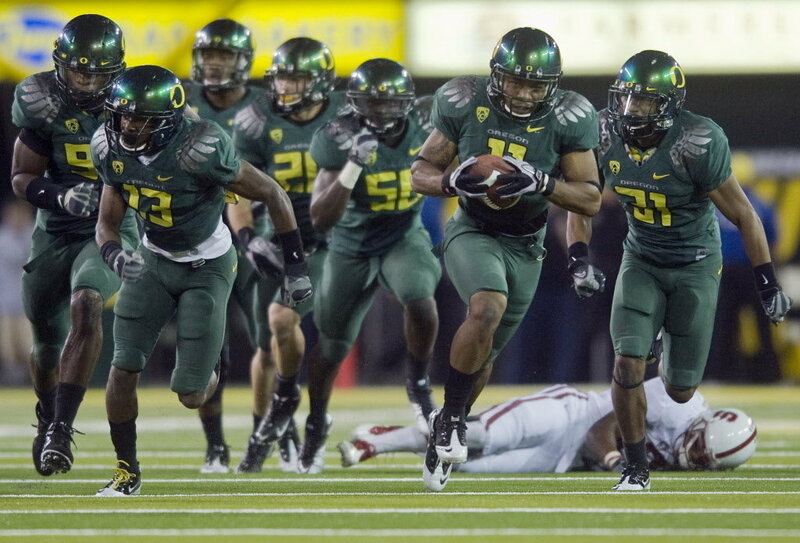 Pure speed helped relieve the nerves of 60,000 Autzen fans. Huff also gains points for helping pioneer the phrase “The Natty”. Oregon finally made it and survived the final six weeks as the top team in the country. The Oregon Ducks would play in its first national championship in their history. Not a big fan of the selections this year they weren’t bad, but personally I missed not seeing the throwbacks that were worn last year vs. Cal and Oregon State. 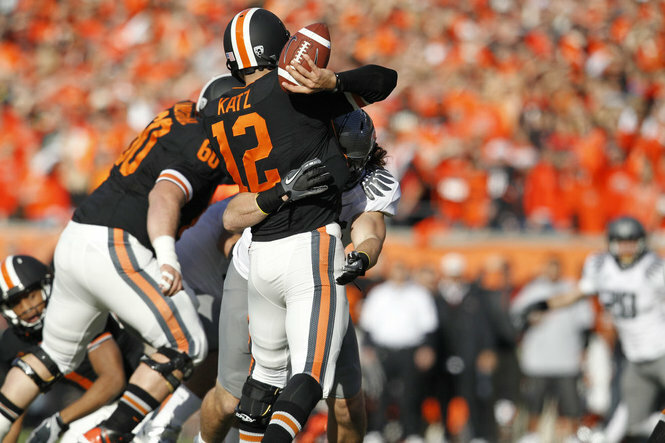 National Title game jerseys would have been rated much lower but really couldn’t figure out a number to assign to them. Agree or disagree with these top 10 plays? Feel free to comment with your opinions or post on our message board HERE.